The Second Epistle of John, also called 2 John, is a book of the New Testament in the Christian Bible. It is the shortest book of the Bible, in terms of verses (13), and the second shortest in terms of words. The letter is written by a person identifying himself as "The Elder" and addressed to "The elect Lady," presumed by most commentators to be a figure of speech meaning a Christian church of a neighboring city. Its purpose is to warn against the heresy known as Docetism, which denied that Jesus had a body of flesh and blood. Apparently some of the members of the church to which the author wrote had been influenced by this teaching. The writer strongly condemns those who deny Jesus' fleshly existence, calling them "deceivers" and "the antichrist." He commands that they should be rejected from Christian fellowship and that those who offer them hospitality participate in evil. The author of 2 John is traditionally believed to be Apostle John, the Beloved Disciple, the author of the Gospel of John, also identified with the author of the Book of Revelation. Critical scholars tend to doubt that the author is the same person that wrote Revelation, but admit a close relationship between 1 John, 2 John, and 3 John, as well as the Gospel of John. Its date is generally believed to be sometime in the late first or early second century C.E. Church tradition beginning with the Council of Rome in 382 C.E. ascribed 2 John to John the Presbyter, as distinct from John the Evangelist, who was believed to have written both the Gospel of John and 1 John. However, modern scholars tend to see a close relationship among all four of the works of the "Johannine" literature, usually excepting the Book of Revelation. The name "John" does not appear in the epistle. Its author calls himself simply "the Elder." He speaks with authority, as one who expects to be heard with respect and obedience. Theologically and stylistically, it resembles the Gospel of John, but many commentators attribute it to the "Johannine community" rather than to that author or the Apostle John. (For a more detailed discussion see 1 John.) Those who suggest an different author hold that the literary style of the community in which John's Gospel was created naturally reflected its style and even borrowed directly from its language. Few critical scholars agree with the traditional view that the author of the epistles is the same John who wrote the Book of Revelation. 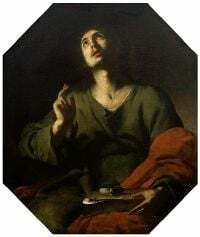 Regarding its date, traditionalists and critical scholars agree that is a relatively late work, for John was believed to have lived a very long life, and was also the youngest of the original disciples of Jesus. The latest it could have been written was 117 C.E., when it was cited by Polycarp of Smyrna. Thus, the late first or early second century C.E. must be the time of its composition. The letter opinions with a salutation from an unnamed writer, called "The Elder," to "the elect Lady and her children." Most commentators see the Lady and her children as symbolic figures representing a church and its members; thus the letter is actually a communication between one Christian congregation and another. A likely candidate is the church at Ephesus or another city in Asia Minor. The idea of the church as an "elect Lady" relates to the Bride/Bridegroom analogy between the church and Christ, as well as husband/wife language used to describe the relationship between God and Israel in the Old Testament. The writer expresses his joy at finding "some of your children walking in the truth." The implication, of course, is that some others of her "children" have strayed from the path. He reminds his readers that "to love" is to to walk in God's commandments. "This is the commandment just as you have heard it from the beginning," he says. "You must walk in it." The author makes his concern more plain in the verse 7: "Many deceivers have gone out into the world, those who do not confess that Jesus Christ has come in the flesh; any such person is the deceiver and the antichrist!" He is apparently concerned with heresy known as Docetism, which taught that because the spirit is good and the flesh is evil, Jesus did not possess a normal physical body like other human beings. Often associated with Gnosticism, this teaching had a significant following, appealing to Christians on the basis of superior spirituality, sometimes including secret teachings revealed by Christ, either while he was on earth through new revelations. The author warns that those who "do not abide in the teaching of Christ, but go beyond it, do not have God." On the other hand, "whoever abides in the teaching has both the Father and the Son." He instructs that those who do not affirm Jesus' physical existence as well as his spiritual being should not be allowed "into the house." This is both an exclusion from joining Christian worship services and a ban against offering the heretics hospitality, for in the first and second centuries, Christian churches met in private homes, not public halls. The writer goes so far as to declare: "Anyone who welcomes him shares in his wicked work." The author concludes that he has more to say to the reader, but hopes to do so in person. He ends as he began, with a figurative greeting from one church to the other: "The children of your chosen sister send their greetings." Interestingly, he does not conclude with a blessing. The dragon of Revelation is often called the Antichrist, but 1 and 2 John used the term in a different sense. Together with its longer companion (1 John) the Second Epistle of John left an important legacy in speaking out against the heresy of docetism. In denying that Jesus had a physical body, the docetists rejected the doctrine of the Incarnation. However, it is not clear how well developed the idea of the Incarnation was at the time 2 John was written. The letter does not specifically endorse the concept that God incarnated in Jesus, only that one who denies that "Jesus Christ has come in the flesh" is an antichrist who does not "have the Father and the Son." In any case, whether or not the author would agree with later expressions of the doctrine of the Incarnation, 1 and 2 John both contributed significantly to its development. In refusing fellowship to heretics, 2 John joined several other late New Testament writings in the practice of shunning those whose teachings it found threatening and offensive. This led in later years to the formal practice of excommunication. The letter is also one of only two New Testament writings—the other again being 1 John—where the term antichrist is used. In these writings, the term does not refer to a single individual, but to anyone who denied that Jesus has a physical body. Later, the term antichrist was combined with prophecies in 2 Thessalonians and the Book of Revelations about a single false prophet who would arise in the Last Days, either identified with or an agent of "The Beast" of the Book of Revelation. All links retrieved September 26, 2018. 2 John (King James Verson Online Bible. 2 John New International Version (NIV) Bible Gateway. 2 John Early Christian Writings. The Second General Epistle of John from Kretzmann's Popular Commentary of the Bible. History of "Second Epistle of John"
This page was last modified on 26 September 2018, at 16:41.